Stand-up, performance poet, podcaster and musician Phill Jupitus has been a team captain on BBC 2’s music quiz Never Mind the Buzzcocks since the beginning in 1996 and also appears regularly as a guest on other panel shows, from QI (on which he has a history of impersonating host Stephen Fry) to Radio 4’s I’m Sorry I Haven’t a Clue. He has also recently released a paperback called Good Morning Nantwich: Adventures in Breakfast Radio which has received lots of positive reviews. Here are some funny quotes by the man. (On QI.) What kind of hellish quiz is this? Which one’s the odd one out? None of them! Bahahaaa! Bahahaaa! (On QI.) Stephen Fry: I’ll give you an extra two points if you can tell me the longest fence in the world. Phill Jupitus: The Great Fence of China! Stephen Fry: Why shouldn’t I strip Alan naked and cover him in gold paint? Phill Jupitus: You win your Oscar properly like everybody else! (On fortune cookies) I wish they’d be a bit more honest—I mean “With the amount of MSG you’ve just had, a massive coronary is on the way”! (On what happened to the crew of the RMS Titanic) I would imagine that in a sinking situation, you’d hope to be getting time and a half. (On the Bayeux Tapestry) Is it like medieval text speak? Brusque is a word that I would gleefully use about myself. I am not everybody’s cup of tea. When you are a smartarse off a pop quiz, that is going to rub some people up the wrong way. I can’t get arrested on the radio by the BBC these days. His career began in the mid-1980s, when he quit working in a Job Centre to become a left-wing punk poet. The former Housemartins press officer also has several dramatic roles under his belt, was the breakfast DJ on BBC 6 Music between 2002 until the end of March 2007, and worked on London’s GLR Radio. He has also supported Billy Bragg on tour, been a member of the West End cast of Hairspray, and is a regular on the summer festival circuit. 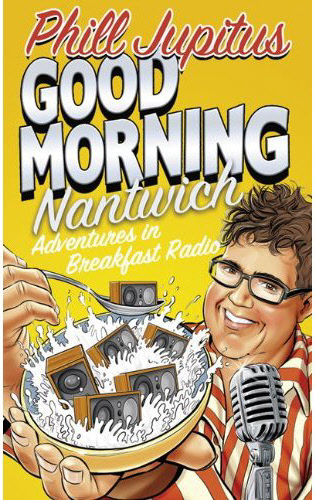 Good Morning Nantwich: Adventures in Breakfast Radio is published by HarperCollins, info further up the page. Never Mind the Buzzcocks is on TV screens in Autumn 2010 for its 24th series!